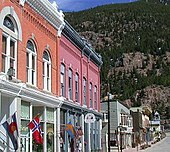 Colorado law makes relatively few distinctions between a city and a town. A Home Rule Municipality may declare itself either a city or a town. In general, cities are more populous than towns, although the towns of Castle Rock and Parker have more than 49,000 residents each, while the City of Black Hawk has fewer than 130 residents.